License Status page contains important licensing information related to your Targetprocess account: URL address of the application, Company name, License Key, Pricing Plan details. Not a reader? Watch the video to learn more about License Status Page in Targetprocess. The information can be checked under Settings → License page. This page is available to Administrators only. If you have any questions regarding terms and limitations, please contact us via email sales@targetprocess.com. To browse the full list of active users, we recommend you to create a special People management view from a template or a dedicated Custom Report. 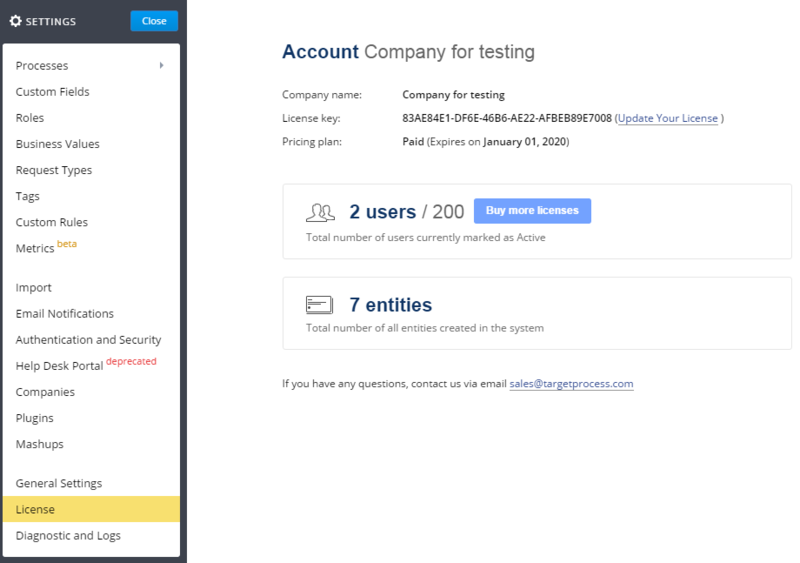 If you have no idea whether your employees have actually been using Targetprocess and if you would like to know how intensively the tool has been used, you may want to observe Last Login Date details as well. If you have users that are no longer part of your project team, you may consider deactivating them rather than deleting and free up licenses for new active users. See How to manage User accounts and Active and Inactive users articles if you need to deactivate or activate user accounts or find how many active and inactive users are registered now in your account. Instead of deleting users completely, we recommend you make users inactive. When you delete a user from an account, you will lose history information about past assignments and items ownership. These details may be valuable for accurate reporting and tracking purposes.